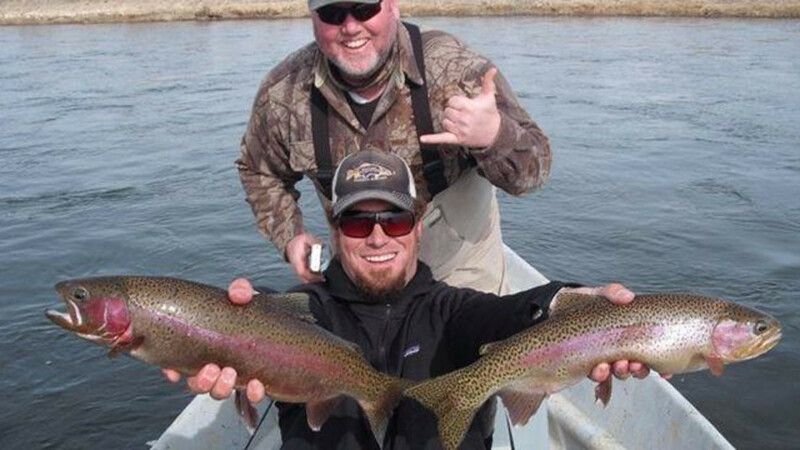 Wyoming Fly Fishing Guide Service and North Platte River Fly Shop Outfitters started running guide trips on the Grey reef sections of the North Platte in 1987, a full ten years before any other outfitters and guide services. We were the first outfitters to start targeting the big trout that these waters have become famous for. Our guides have been rowing this river longer than any other guide service. Today we are the largest and most experienced guide service on the Grey Reef, Miracle Mile and Fremont Canyon sections of the North Platte River. With over 80 miles of float-access and 40 miles of wade-access waters with some private water, we can provide a multitude of guided fishing trip options. The oldest and most experienced Grey Reef outfitters..... combined with some of the biggest wild trout in the country can only produce great photos and memories. Our fly fishing clients experience some of the best fly fishing Wyoming has to offer. You will enjoy the time spent with your guide as you pursue some of the largest rainbow trout in the lower 48 states. A day well spent brings everyone home with fish stories to last a lifetime. Give us a call and come experience what Wyoming Fly Fishing Outfitters can offer for a great summer Grey Reef fly fishing vacation. First Rate And Fun , Even For Novice!